Santa Barbara Plumbing is the County’s essential resource for the finest fixtures for your kitchen, bathroom, and laundry room. Since 1984, our customers have collaborated with our knowledgeable and friendly kitchen and bathroom design consultants to find the most exquisite and integral bathtubs, sinks, toilets, faucets, cabinets, and hardware for your remodeling and new construction projects. With the largest retail inventory in Santa Barbara, our sizable showroom features complete displays of bath and kitchen design ideas all the way down to the underlying pipes and fittings. With our incredible selection, we can help you coordinate fixtures to complement your perfect room. Whether it’s the kitchen, bathroom, powder room, or laundry room, we’re sure to have the perfect piece that boasts aesthetics, functionality, and price. Visit our bath and kitchen showroom for design inspiration and leave knowing you’re in good hands with an expansive vision of the plethora of possibilities that can turn your house into your dream home. If you have any questions, please call one of our knowledgeable and friendly kitchen and bath design consultants at (805) 965-5291. We’ll be happy to answer any of your questions. 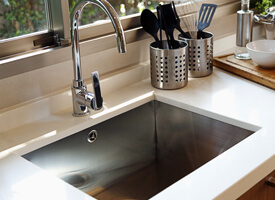 Complete your dream kitchen or bath with a beautiful, durable sink. 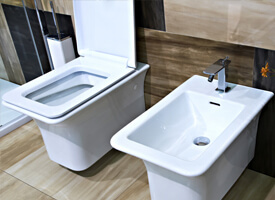 We have a wide selection of top-of-the-line sink options from utility sinks for the laundry room to undermount and trough sinks for the kitchen and bath. Find the best toilets from the makers of the best brands with water saving, industry-leading innovations and designs. With the largest retail inventory in Santa Barbara, you’re sure to find the right toilet for your bathroom. Our bathtubs are overflowing with style, function, and beauty. You can find a great selection here from cast iron tubs to freestanding tubs and everything in between. 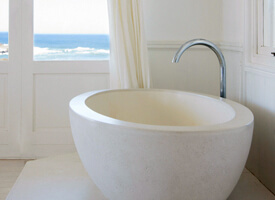 With our competitive prices, you’ll get a great price on a luxurious bath tub. 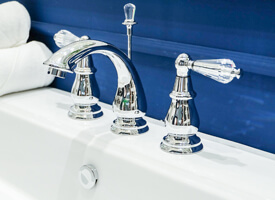 From faucets for your kitchen, bathroom, or laundry room to shower heads and complete collection accessories like towel bars, towel rings, robe hooks, and more, you’ll find the best selection at Santa Barbara Plumbing Supplies.